Congratulations to Dave and Ella for a safe, remarkable return home safely. Special thanks to K9 Jake for all his work in showing us where Ella was staying in the woods. Ella spent a full WEEK of playing with the Coyotes!!! Yes, you read that correctly. K9 Jake went out to search for Ella and indicated where she was. A camera and trap were set up in that area. And — lo and behold — Ella found a coyote friend! We even caught a picture of them playing! It took about a week for Ella to enter the trap. The coyote also checked out the trap but refused to go in. It might be that Ella was following its lead until she got too hungry and went in. This was nerve racking to watch all week. 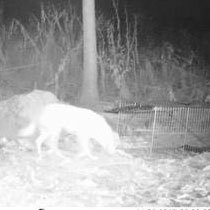 On a side note, this is not the first time we have had a dog hang out with the coyotes. Coyotes and dogs can cross breed and their offspring are called Coydogs.